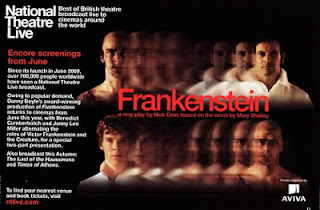 2011 saw Academy Award winning film director Danny Boyle return to his theatre roots for his unique production of 'Frankenstein', adapted by scribe Nick Dear from Mary Shelley's original text. The modern production intriguingly alternated its lead roles between Benedict Cumberbatch and Jonny Lee Miller, and is being shown across UK cinemas in special encore screenings. 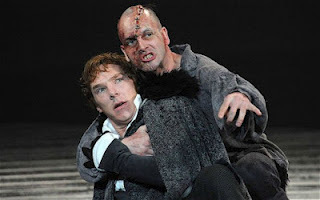 The screening I viewed used 'Sherlock' star Benedict Cumberbatch as Victor Frankenstein and Jonny Lee Miller as his creature, while a recent previous screening saw the two leads swap roles. By most accounts, both versions of the production are fantastic hence a 2012 Olivier Award for both Cumberbatch and Lee Miller. This latest adaptation of 'Frankenstein' is very much seen from the perspective of the creature, who we see from birth. Its development is as fascinating as its later interactions with its creator, with Jonny Lee Miller delivering a consistently excellent performance as the creature metamorphoses into intelligence and malevolence. Cumberbatch also delivers a fine performance, albeit constrained by his limited character, as is now expected from a man who has appeared in the likes of 'Tinker Tailor Soldier Spy' and will be a main character in the upcoming 'Star Trek' sequel. Unfortunately, the acting is not uniformly above par as Victor's father and brother - played by George Harris and Jared Richard - are wooden, in comparison. New Bond girl Naomie Harris however is a joy, despite her character being rather set aside by the main duel. Her swirling emotions grounding the production among its fantastical premise. Indeed, even two hundred years on, genetically modified experiments have not reached anywhere near the level of Shelley's imagination. The rotating set design and lighting is superb and the soundtrack provided by Underworld heightens the mood in each scene - at its best, in its more electro-industrial moments. The dutch angles are somewhat distracting but allow for theatre-goers to experience the play anew (or should that be, askew) which is surely part of the exercise. For others, it is an opportunity to experience a fascinating stage production that they may otherwise have missed on its original, sold-out run. 'Frankenstein' is being shown as part of the NT Live initiative in selected UK cinemas this July. More details at nationaltheatre.org.uk.